2 weeks ago, I made a 2-tier cake for an order. A 2-tier cake covered with fresh (whipped non-dairy) cream. For a 21st birthday. Fresh cream? In humid Singapore? Theoretically, it should work. 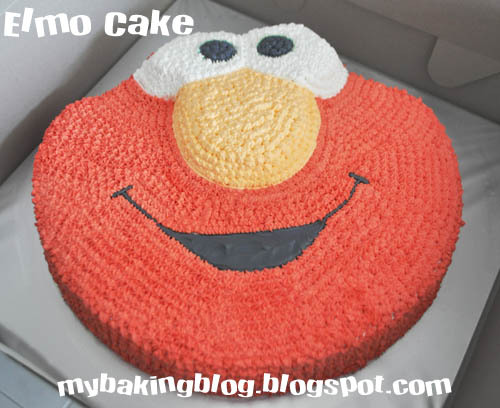 This was what I had thought, though I have only read and seen people using buttercream or fondant. As the date drew nearer, I started to panic. I wonder why I had even suggested using fresh cream. I googled for hours and never seem to find anyone making 2-tier cakes this way. And it was for a 21st birthday! What if I screw up the poor girl's birthday?? You are only 21 once in your lifetime. Oh right, you will also be 8, 33, 47 once. But 21st birthday is like a big milestone in life. I even had stupid ideas like telling her that my fridge has spoilt at the last minute and I could therefore only make fondant cakes. But no, that would be too cowardly. Honestly, I never felt so stressed up in any of my previous jobs. The thought of screwing up really gave me big jitters. Real big ones. The baking of the top tier (a 6") was ok. It was the baking of the bottom tier. The recipe I used was usually for a small batch and has never been multiplied so many times before. It seemed to take forever to bake. And when I finally took it out, it was 1.5 hours later and not good. I really hated to waste ingredients but I couldn't possibly use that for someone who had paid for my cake. So, down the bin went a 10" cake. I baked another one again and thankfully it turned out much better. It was midnight, but I had to wait for the cake to fully cool and give it a crumb coat so that the crumb coat can stay the night in the fridge. Seriously, I have a love-hate relationship with fresh cream cakes. I love the lightness of the cream and that it is so easy to prepare. But I hate it because my hands are always too warm to work with it. In fact, my hands are often too warm for any icing. I used many methods (placing my hands on ice, on ice-pack, wear fabric gloves (?) ) and still nothing works satisfactorily. For my earlier Elmo cake which I piped stars all over, it was supposed to be a simple task. But because of my hands, I had to return the cake and whipped cream to the fridge/freezer so often every now and then, the simple task took hours instead. 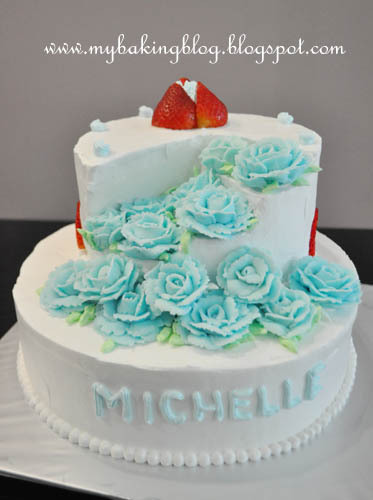 Thankfully, for this 2-tier cake, there was not much to pipe other than the borders. The birthday girl liked the cascading roses of my other 2-tier fondant cake. But this being cream, the flowers would slide off the sides. So, I made steps and placed the flowers on the steps instead. On the top, there were a few small piped rosettes. Strawberries were also requested. It was a good thing that strawberries are in season! I assembled the whole cake at home but brought along extra icing, roses and strawberries just in case they were needed when I reached the place. The journey there was another heart-pounding time. Usually, when I make deliveries, I would be the driver, so that I can drive as gently and slowly as I want to. That day, I decided to hold on to my cake instead. My driver (aka my husband) is not as gentle a driver as me, and it was at times like this that you realise almost all of Singapore's roads are being dugged up to lay cables and are super bumpy. At first, I lifted up the cake box whenever we go over uneven ground so that the fragile cake would not get so much shock. Eventually, I put down the box only when the car is stationary. I was very relieved when the cake (and cream) made its way to our destination without any problems. I could not wait to hand over the cake. There was no excitement when the birthday girl saw the cake. That got me a little worried. I always look out for people's first expressions when they receive their orders. But it was only after handing over the cake, that my pruned-up face managed a smile, almost a first in 2 days. This is my first order for a 2-tier cake and even though I put in a lot of effort, I know this cake has a lot of room for improvement. It was because of the amount of time spent on this cake, that I did not have time to make anything for my father on Father's Day though I had many ideas in my head. The next night, I received an sms from the birthday girl with many kind words of thanks and appreciation and that she really liked her cake very much. 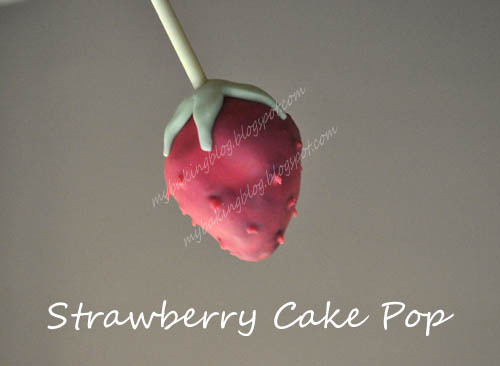 The strawberry cake pops I made were also well received by her guests. When I saw the sms, I felt so thankful. So thankful for the opportunity and thankful for the trust given to me, that I almost wanted to cry. With every cake made, I learn something new and I get better at some things. 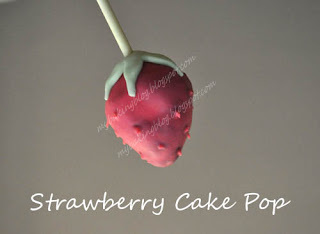 This drives me to want to work harder to hone my skills and make much better cakes in future. Meanwhile, I'm hoping to get more cake orders soon. that cake looks AMAZING! i hope i can make one like that one day. Thanks for dropping by, I'm sure you can do this pretty soon, you are good!